Parenting A Complex Special Needs Child: Keep Him Busy or Else!! Keep Him Busy or Else!! A consultant told me years ago that if we didn’t keep Billy Ray busy he would find ways to fill the time. It might not be what we wanted him to do but he would fill the time (getting into things he shouldn't, etc.). It has been difficult keeping his schedule current in the past year because he has experienced so many medical issues. The signs be read to know if he is well enough to be busy again. Saturday, he was giving me signs that he needs more to do. I had just finished sending in the proposal for a new book and a cup of coffee and a rest sounded wonderful. Billy Ray was watching a movie and seemed content with his Saturday morning routine. Within a minute after I sat down with him, Billy Ray got up and went into the guestroom bringing the vacuum out saying “vacuum”. 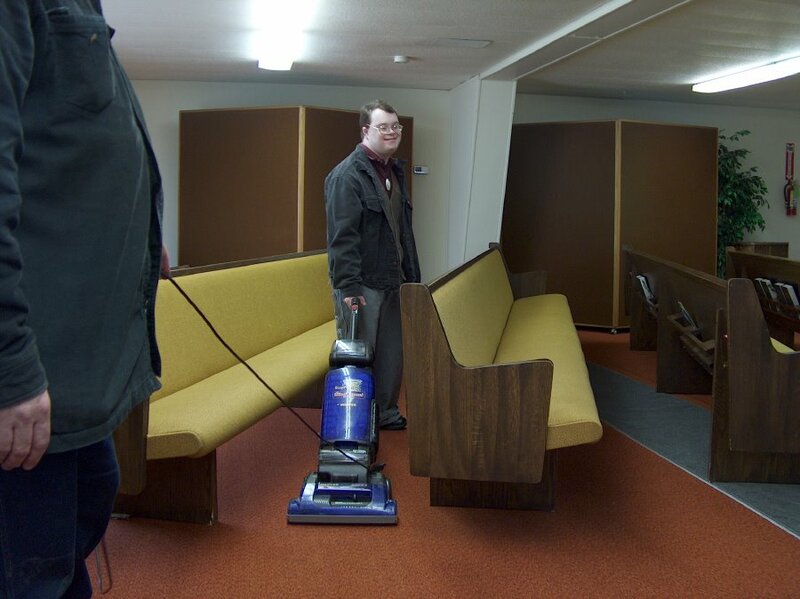 He wanted to vacuum the hallway that he had just done the day before as a part of his schedule. His schedule was modified a bit this week in that they ask him to deliver Meals on Wheels Thursday as well as his normal weekly delivery on Wednesday. On Thursdays, he normally does some activities at the church, which could easily be moved to Friday morning. We weren’t sure how he would handle the change in schedule but he was thrilled. He genuinely loves delivering the meals. On Fridays, he goes bowling in the afternoon. Most of his activities start earlier in the day but the bowling alley doesn’t open until noon. Last Friday he went to the church to shred papers, vacuum hallways and empty trash which he would normally do on Thursday mornings. Then in the afternoon, he did his normal Friday activities. He seemed to tolerate the extra activities on Friday, still got his activities at home done and was looking for more to do by the end of the day. Needless to say I will be looking at his schedule this week. Has Billy Ray ever received an award for public service? I sure do think the big guy deserves one! He helps so many people by giving his time and I know that it helps Billy Ray too:)He looks very happy in the photo, he is all smiles! Thanks Tina. Billy Ray has not received a public service award but he did go to a volunteer luncheon recently for the Meals on Wheels volunteers. He got lots of neat little trinkets about being a volunteer. Basically he does volunteer activities because he wouldn't be able to handle a regular vocational program. He needs a totally individualized schedule. His regular support staff enables him to be able to go to these places and he loves the interaction. i just went thru ur blog.i can relate coz i too have a special child.keep posting.god bless.